If a newspaper is going to write a news story, it might as well take a moment to copy and paste information from a city council agenda packet. Especially when what is missing from the story is perhaps the most important information. Why can’t the city council simply wave a magic wand and absolve Cargill of paying millions of dollars in property and sales taxes? 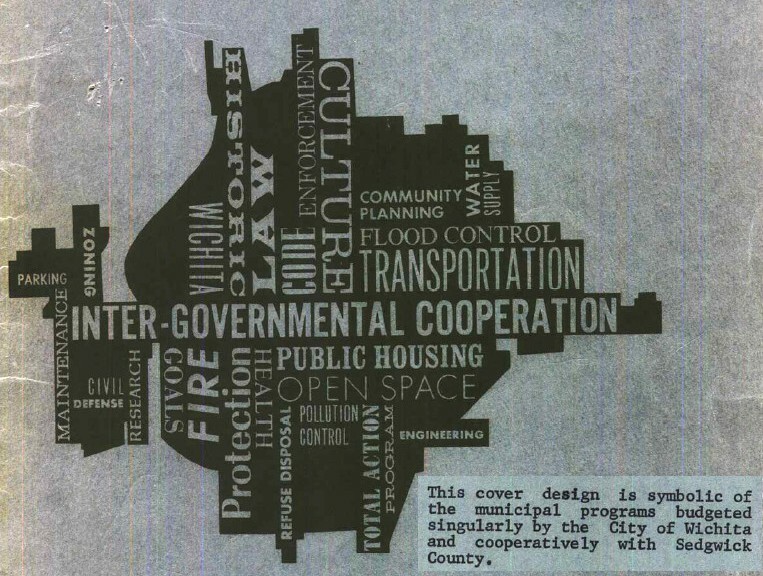 This is what the city council did, but in a roundabout way. But because the tax giveaway is mixed with confusing details of bonds, many citizens don’t notice the giveaway. Especially when our city’s leading newspaper does not report this. But for the remainder of the project, as is the case for most IRB-funded projects, it is not likely the facility will save on interest costs with IRBs. The article is correct in that IRBs require no taxpayer commitment. The city makes no guarantee as to the bond repayment. If the city did guarantee repayment, that would help the borrower obtain a lower interest rate. But there is no guarantee. How much will this cost Wichita taxpayers? How much, if anything, do tax abatements cost? Someone asked a question regarding an item on the Wichita City Council agenda today: How much will this cost taxpayers? How much do these bonds cost taxpayers? 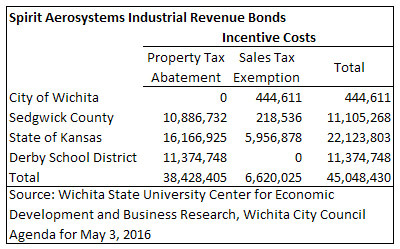 It’s important to remember that with Industrial Revenue Bonds in Kansas, cities and counties are not the lender. 3 If this company was not able to pay the bond interest or principle, the city would be under no obligation to pay. The city makes no guarantee as to repayment. Bond buyers know this. So if the city is not lending money, and if the city is not guaranteeing repayment, do these bonds have a cost to taxpayers? The answer depends on which side of the fence you sit. The benefit to WAM, today’s applicant, is that IRBs carry with them tax abatements. Specifically, a whole or partial exemption from paying some property taxes. Additionally, IRBs also enable escape from paying sales tax on purchases made with bond proceeds. So one way to look at the IRBs is that they do indeed have a cost. The city, county, school district, and state will not receive tax revenue they otherwise would receive. The second argument is that by building something, new jobs and commerce are created. These new employees and commercial activity pay taxes. The city and other jurisdictions receive more from these new taxes than they gave up in tax abatements. This is called the benefit-cost ratio. It’s computed by Center for Economic Development and Business Research (CEDBR) at Wichita State University. City documents often refer to something like a “1.57:1 benefit-cost ratio,” meaning that for every one dollar foregone in tax revenue, the city expects to gain $1.57 in other tax revenue. There are problems with these arguments. For the first: The developer of this project says the incentives are “critical.” If true, this claim exposes a large problem, which is if taxes are so high as to block investment, how are we going to grow as a city and region? Will every project require tax incentives? If not, why do some say they need incentives, and some don’t? Second: Remember that government says that with the new project, tax revenue will increase. But this almost always happens regardless of whether the company has received incentives. Therefore, the benefit-cost ratio calculations are valid only if incentives were absolutely necessary. But this is not all. The applicant company will almost certainly receive an exemption from paying sales tax on the building. City documents did not provide an estimate for how much sales tax might be abated, but it could be several hundred thousand dollars. Following the Wichita Mayor, the Chair of the Sedgwick County Commission speaks on economic development. 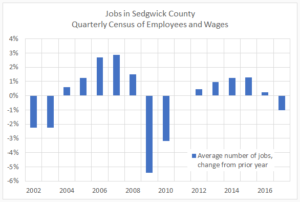 Last week Sedgwick County Commissioner David Dennis penned a column for the Wichita Eagle praising the county’s efforts in economic development. 1 Dennis is also chair of the commission this year. This emphasis on the word “momentum” seems to be a fad among Wichita’s government leaders. More about this later. You might be wondering if the county is treating this contribution as an investment that a business would make, where it would earn back its investment plus a profit by collecting rent from Spirit. After all, county leaders tell us they want to operate government like a business. But, you’d be wrong if you thought that. The memorandum specifies the rent as $1 per year. Not $1 per square foot per year, but $1 per year for the entire building. Furthermore, at the end of 20 years, Spirit will have the option to purchase the property for $1. There’s really no way to characterize this transaction other than as a multi-million giveaway to Spirit. Not directly as a blank check or cash, but in a roundabout way that costs the county and benefits Spirit in the same way as cash. I can understand how Dennis and others like Wichita Mayor Jeff Longwell want to convince the public that they are no longer dishing out cash. Often, the public doesn’t like that. So instead they do the same thing in roundabout ways like leasing a building for $1 per year or paying millions in cash for a “parking easement” for which the city has no real use. 5 Chairman Dennis and others hope you won’t notice, but these leaders would be more credible if they didn’t try to obfuscate the truth. Sedgwick County jobs. Click for larger. Sedgwick County jobs, change from prior year. Click for larger. There’s that word again: momentum. 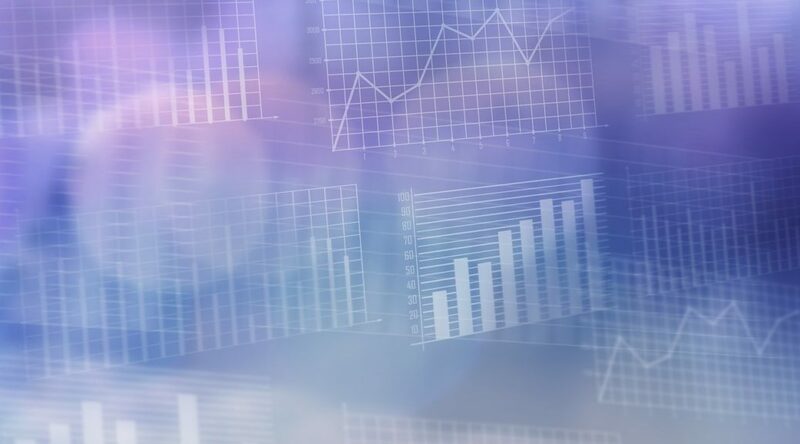 Coincidently, shortly after this column was published, the Bureau of Labor Statistics published an update to the Quarterly Census of Employment and Wages. 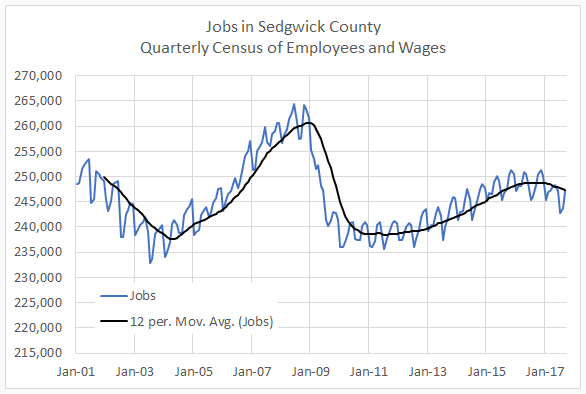 It shows the number of jobs in Sedgwick County declining. 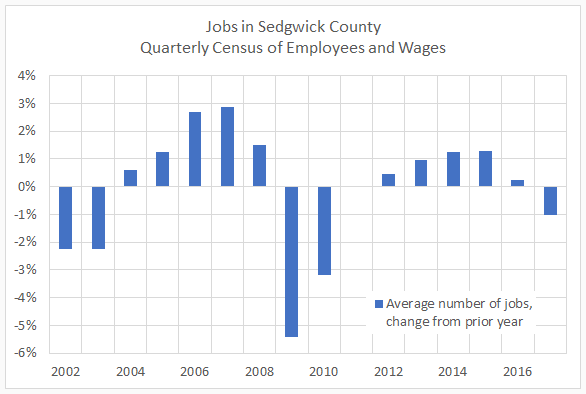 This update was released after Dennis wrote his column, but as can be seen from the nearby charts, the slowdown in Sedgwick County jobs and the Wichita-area economy is not a new trend. If Dennis really believes our economy has “momentum and forward movement,” it is my sincere hope that he is simply uninformed or misinformed about these statistics. Because if he is aware, we can only conclude that he is something else that is worse than being merely ignorant. Is it equitable for business firms to pay no sales tax, while low-income families pay sales tax on groceries? Last week I wondered if the city’s agenda packet for economic development incentives proposed for BG Products was complete. 1 Since the city’s narrative had no mention of a sales tax exemption, but the accompanying ordinance that was passed authorized a sales tax exemption, I wondered if the analysis performed by the Wichita State University Center for Economic Development and Business Research was correct. Now that I’ve received the document, it appears that CEDBR’s analysis properly included the cost of the sales tax exemption incentive. 2 The city’s narrative did not mention the sales tax exemption. 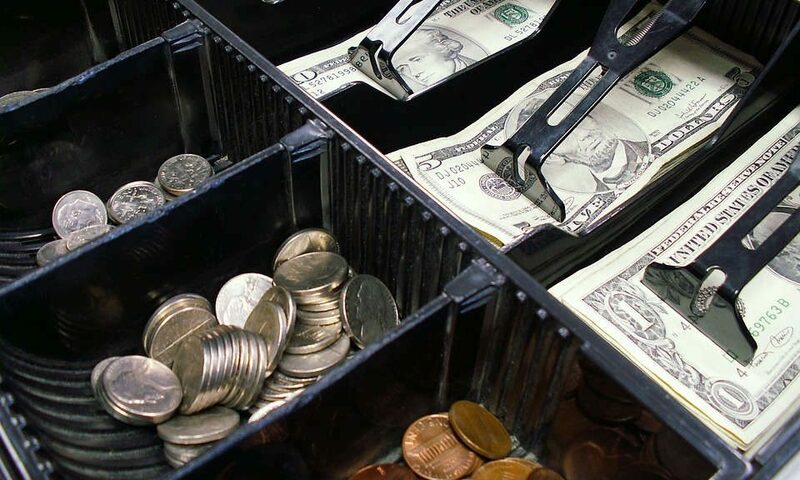 The State of Kansas applies the full sales tax rate to groceries, and is one of the few states to do this. 5 This tax disproportionally harms low-income families. 6 This is a problem in equity, in that business firms may request sales tax exemptions without showing need, while low-income families have no way to avoid the sales tax on their groceries. The City of Wichita says it does not want to use cash incentives for economic development. But a proposal contains just that. Update: The council did not approve this project, by a vote of four to three. The Wichita Public Building Commission will sell the building for $100,000. The project is also asking for the city to issue Industrial Revenue Bonds. Despite the use of the term “bond,” the city is not lending money to anyone. Someone else will purchase the bonds. Instead, the IRBs are a vehicle for conveying property tax abatements and sales tax exemptions. In this case, the developer requests a sales tax exemption for purchases during the renovation. City documents don’t give a value for the sales tax that might be exempted. But the developer has requested IRBs for an amount up to $35,000,000. Therefore, a sales tax exemption might be worth up to $2,625,000, depending on the price of taxable products and services purchased, and the sales tax rate at the time. Whatever it is called, this is a cash incentive. I’m sure the city will characterize its $2 million “investment” in some way other than a cash incentive. The city will also say the $1 million from the WPBC is not from the city, which is true. But the city will have to rationalize allowing the commission to violate the clear language of its statutes. There are some good aspects of this agreement with the developer, such as a timeline and performance bond requirement. But the cash incentives are against stated city policy and its laws. Won’t anyone develop in downtown Wichita without incentives? Action the Wichita City Council will consider next week makes one wonder: If downtown Wichita is so great, why does the city have to give away so much? Next week the Wichita City Council will consider a package of incentives for the developer of a large downtown building, the Finney State Office Center. The building has an appraised value of $7,902,570, per the Sedgwick County Treasurer. The city will sell it for $100,000. That’s a mere 1.3 cents per dollar, if the county’s valuation is reasonable. 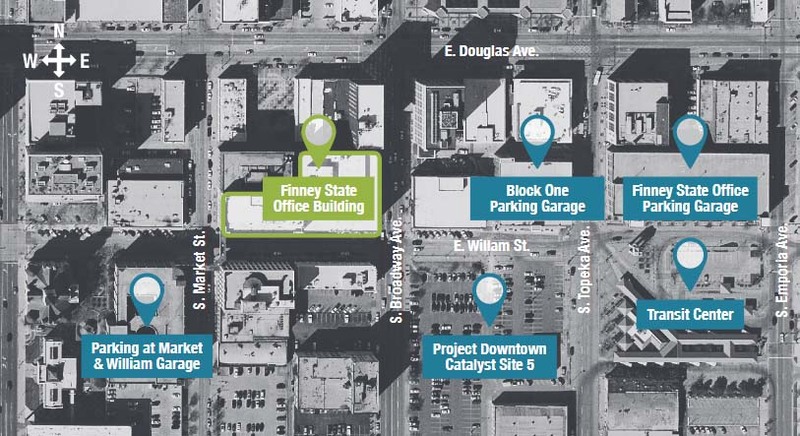 Finney State Office Building environs. Click for larger. In this case, the developer requests a sales tax exemption for purchases during the renovation. City documents don’t give a value for the sales tax that might be exempted. But the developer has requested IRBs for an amount up to $35,000,000. So a sales tax exemption might be worth up to $2,625,000, depending on how much taxable products and services are purchased. IRBs also carry the possibility of a property tax abatement. Granting of the abatement is routine in most areas of the city. But, this property is located within a tax increment financing (TIF) district. That means, according to Kansas law, that a property tax abatement may not be awarded. That is, unless the property is removed from the TIF district, which is what the city proposes. What is the value of the tax abatement? City documents don’t say. But if the developer spends $35 million on the project, it ought to carry something near that appraised value when complete. So its annual property tax bill would be ($35,000,000 * 25 percent assessment rate for commercial property = $8,750,000 assessed value * 124.341 mill rate) $1,087,984. There’s another exception the city will probably make for this project. According to the city’s economic development incentives policy, the city must receive a payoff of at least 1.3 times its investment. That benchmark isn’t met in this case, with Wichita State University’s Center for Economic Development and Business Research reporting a benefit-cost ratio of 1.04 to the city. Nonetheless, city staff recommends the city approve the incentives, citing several loopholes to the policy. There’s also a parking agreement to consider. Given the city’s past practice, the city will lease parking stalls at rates below market rate or the city’s cost to provide. The city, in particular Wichita Mayor Jeff Longwell, have prominently and proudly touted the end of cash incentives. But, this project is receiving benefits better than cash: An $8 million building for a song, no sales tax, and no property tax for ten years. Let’s ask the city to be honest and give us dollar values for these incentives. A second question is this: Why is it necessary to provide all these incentives in order to induce someone to develop in downtown Wichita? The cost of these incentives increases the cost of government for everyone else — that is, everyone else except all the other incentive-receivers. 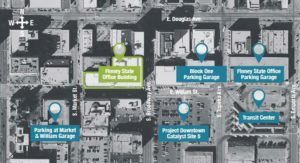 A downtown Wichita project receives a small benefit from the city, with no mention of the really big money. Today the Wichita City Council approved a subsidy for a project in downtown Wichita. The city will lend the developer of a project at 303 S. Broadway $620,000 to improve the building’s facade. The property must repay this amount through an assessment on its property tax. The benefit to the property is that the city is able to borrow money at a lower interest rate, and this reduces the cost of borrowing for the project. Upon inquiry to the city, I was told that the facade improvement program would increase the developer’s return on investment from 7.06 percent to 8.35 percent. This seemed a stretch; that a small savings on interest costs on a small portion of the project cost could have such a large effect on profitability. I asked the city for supporting documents that hold the figures used to calculate these amounts, but the city believes the Kansas Open Records Act does not allow it to release the records. In the past, however, I have received this information on request. So, we’ll have to trust the city on this matter. I’m not comfortable with that. This is another example of the city conducting business within a cloud of secrecy. The cost savings on borrowing $620,000 is just a small portion of subsidy this project will receive. Through tax credits, this project likely will receive over two million dollars in a form equivalent to cash. The property was listed on the Register of Historic Kansas Places in August. This entitles the project to a tax credit of 25 percent of qualified expenses.2 With a project cost of $5,000,000, according to city documents, this tax credit could be worth $1,250,000. From the National Park Service, a credit of 20 percent may be awarded.3 With a project cost of $5,000,000, according to city documents, this tax credit could be worth $1,000,000. It is not known at this time whether this project has qualified for this tax credit. Together, the tax credits are worth potentially $2,250,000. Not all citizens may be aware of the mechanism of tax credits. In the case of the state of Kansas, the Department of Revenue will — figuratively — print a certificate that says the holder of this certificate may use it to pay $1,250,000 of state tax liability. It costs the state nothing to create this certificate. When the Department of Revenue receives the certificate instead of cash, the state gains nothing of economic value. The net economic effect is that the holder of the tax credit has been enriched by $1,250,000, and the state misses out on the same amount of revenue.4 Unless the state reduces its spending by the amount of the tax credit, the taxpayers have to make up the lost revenue. This is not all. The project may apply for Industrial Revenue Bonds. This is a mechanism whereby a project may avoid paying property taxes and sales taxes.5 This property is located within a TIF district, so it is ineligible for property tax abatements. But, a sales tax exemption could be possible, if the developer applies. Of note: This developer actively campaigned for the proposed 2014 Wichita city sales tax, offering free office space to the effort.7 Should he apply for a sales tax exemption on this property, this is another example of low-income families in Wichita paying sales tax on groceries, but well-off developers escaping paying that same tax. At the council meeting, a citizen remarked how this project is good for the tax base. But, being in a TIF district, the incremental property taxes from this property will go to the TIF district, not the city, until the TIF debt is retired. Council Member Janet Miller (district 6, north central Wichita) noted that the city is not contributing to the project, that the developer pays all the costs of the facade improvement loan. But of a direct contribution to the project, she said “Although I wouldn’t probably complain if that was a request.” I’d suggest that Miller read up on the economics of tax credits, and of a possible sales tax exemption. She might be surprised to learn how much cash this project is receiving. The Wichita City Council approves economic development incentives, but citizens should not be proud of the discussion and deliberation. 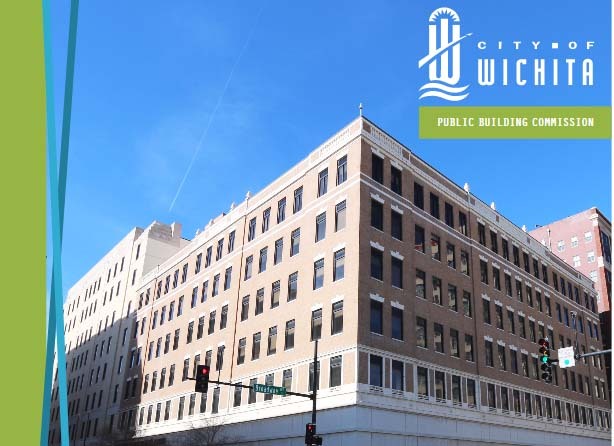 Today’s meeting of the Wichita City Council saw the council discuss and approve economic development incentives for a project in downtown Wichita. The item contemplated economic development incentives for redevelopment of an empty building in downtown Wichita to become a Hilton Garden Inn Hotel. The incentives being considered were a Community Improvement District (CID), Industrial Revenue Bonds (IRB), a parking agreement, and a skywalk easement. 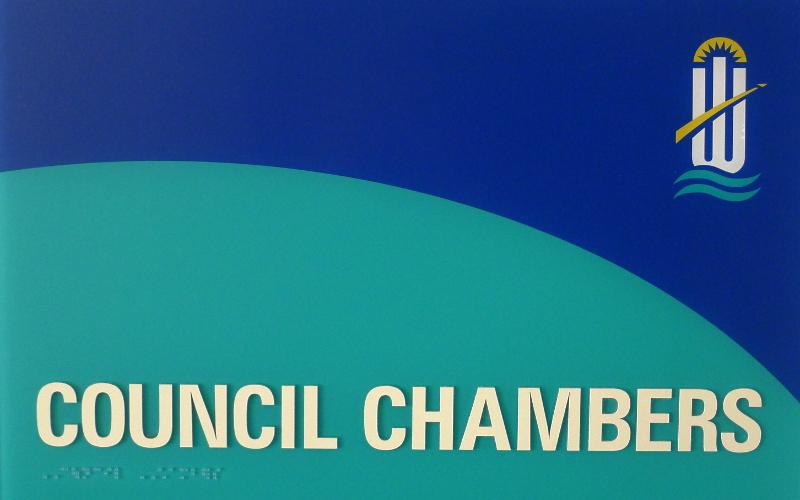 The discussion by the council was useful for revealing two members who are opposed to some targeted economic development incentives, but it also showed a troubling lack of knowledge and consideration by others. The hotel is requesting industrial revenue bonds. These bonds do not mean the city is lending any money. Instead, IRBs in Kansas are a mechanism to convey property tax abatements and sales tax exemptions. The agenda packet for this item states: “[Hotel developer] WDH is not requesting abatement of property taxes in conjunction with the IRBs.”1 This is presented as a magnanimous gesture, as something the hotel developers (WDH) could have requested, but did not, presumably out of some sort of civic duty. But: Property tax abatements may not be granted within the boundaries of a TIF district, which this hotel is located within.2 3 So the developers did not request something that they are not entitled to request. This is not news. Nonetheless, several council members were grateful. Asking about tax abatements, Wichita City Council Member Pete Meitzner (district 2, east Wichita) asked “They didn’t apply for other …” His voice trailed off before finishing the question, but the “other” tax abatement that could be applied for is the property tax abatement. Except, the law does not allow for a property tax abatement for this project. All these questions alluded to the increased property taxes the renovated building will pay. Except, being within a TIF district, property taxes may not be abated. So where will the hotel’s property taxes go? First, the property tax generated by the present value of the property (the “base”) will be distributed as before. But the increment — which will be substantial — will go to the TIF district, not the city, county, and school district. Except: This is an unusual TIF district, in that an agreement between the city and county provides that only 70 percent of the incremental property taxes will go to the TIF district, with the remainder being distributed as usual. This was not mentioned during today’s discussion. There was talk about a “gap.” Some economic development incentives require documenting of a “financing gap” that makes the project not economically feasible. But that is not required for the incentives considered for this hotel. Regarding the sales tax exemption: City document do not state how much sales tax will be forgiven, so we’re left to speculate. Previous city documents5 indicate spending $3,000,000 on furniture and fixtures, which is taxable. Sales tax on this is $225,000. Curiously, council members Clendenin and Williams, who represent low-income districts where families may be struggling to buy groceries — and the sales tax on them — did not object to this special sales tax treatment for a commercial developer. In his remarks, the mayor talked about how we can continue with economic development “without handing cash to corporations.” But when a project is going to buy materials and services on which $768,750 in sales tax is normally due, and the city council takes action to extinguish that liability, well, that’s better than cash to the receiver. Kudos to Wichita City Council Member Bryan Frye (district 5, west and northwest Wichita), who actually cited the United States Constitution in his statement from the bench. He said that the issues surrounding this project are a far cry from what our Founding Fathers envisioned as the role of government, saying “I struggle with using city resources to collect and distribute sales tax for the sole benefit of one commercial entity.” He offered a substitute motion which would have approved all the parts of the agreement except for the CID tax. His motion failed, with only he and Wichita Mayor Jeff Longwell voting in favor. On the original motion, which was to approve all parts of the incentive agreement, Longwell and Frye voted in opposition, with everyone else voting in favor. Another Wichita company that paid to persuade you to vote for higher taxes now seeks to avoid paying those taxes. Next week the Wichita City Council will consider issuing industrial revenue bonds to benefit a local company. In Kansas, IRBs are not a loan of money from government. Instead, the bonds are a vehicle for conveying property tax abatements, and often sales tax exemptions. 1 The applicant company is Hijos, LLC/JR Custom Metal Products, Inc.
City documents give the value of abated taxes at $44,900 for the first year. Following years will probably be similar. Besides property tax breaks, industrial revenue bonds can convey an exemption from paying sales taxes on purchases. City documents don’t state the amount of sales tax the company might avoid paying. But documents state the bonds will be used to fund capital equipment in the amount of $2,686,000. Sales tax on that is $201,450. City documents also state this expansion will add 13 new jobs over the next five years at an average wage of $41,995. Like several other companies that have received an exemption on paying sales tax on their purchases, 2 3 4 5 JR Custom Metals advocated for you to pay more sales tax. During the campaign for the one cent per dollar Wichita sales tax in 2014, this company contributed $1,000 to persuade voters to approve the tax. JR Custom Metals contribution to Yes Wichita, the group that campaigned for the Wichita sales tax. But now it seeks to avoid paying all sales tax on these purchases. It has done this several times in the recent past. The jobs are welcome. But this incident and many others like it reveal a capacity problem, which is this: We need to be creating nine jobs every day in order to make any significant progress in economic growth. 6 If it takes this much effort and the forgiveness of hundreds of thousands of dollars in taxes to create 13 jobs over five years, how much effort and subsidy will it take to create the many thousands of jobs we need to create every year? Wichita’s largest employer asks to avoid paying millions in taxes, which increases the cost of government for everyone else, including young companies struggling to break through. 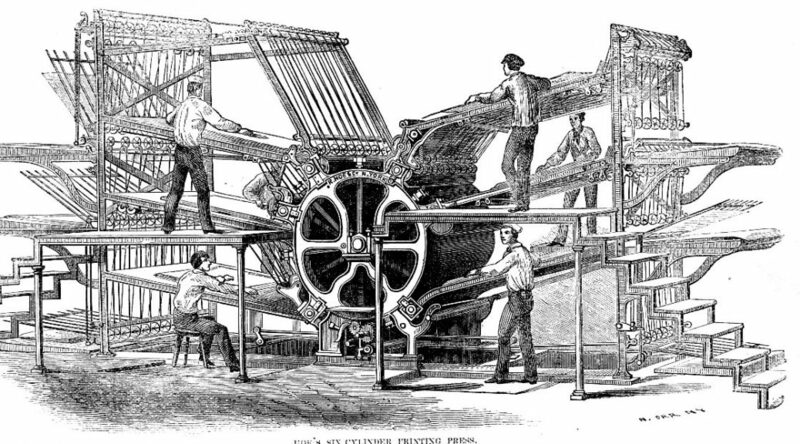 Industrial Revenue Bonds are a vehicle for generating and conveying tax exemptions. 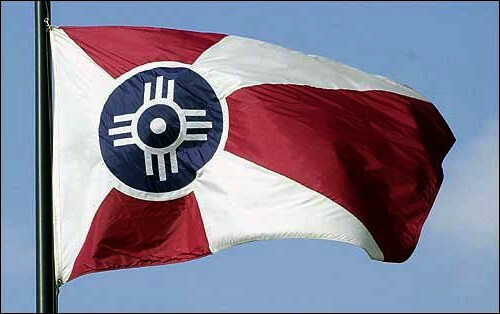 2 In the IRB program, government is not lending money, and Wichita taxpayers are not at risk if the bonds are not repaid. In fact, in the present case the applicant company plans to purchase the bonds itself, according to city documents. Instead, the purpose of the IRB process is to allow Spirit to escape paying property taxes and sales taxes. Cost of Spirit Aerosystems incentives. Usually the agenda packet the city prepares for council members and the public contains the amount of tax expected to be foregone. For this item that summary is missing, and the sales tax exemption is not mentioned. I have prepared a table summarizing data from the analysis prepared for the city by the Center for Economic Development and Business Research at Wichita State University. Of note, the share of the cost of the incentives born by the City of Wichita is small, slightly less than one percent. The bulk of the cost is born by the State of Kansas, with the Derby School District and Sedgwick County facing smaller shares of the cost. Also, the city is forcing a decision on a neighboring jurisdiction that it would not accept for itself, unless it uses one of many exceptions or loopholes. This adverse decision is forced upon the Derby School District. It faces a benefit-cost ratio of 1.16 to 1, which is below the city’s standard of 1.30 to 1, unless an exception is cited. 3 The Derby School District is not involved in this action and has no ability to affect the issuance of these bonds, should it desire to. Besides this, the granting of these tax breaks calls into question the validity of taxation. If a company can be excused from tens of millions of dollars in taxes, can we say there is equal treatment under law? When large companies receive tax abatements and exemptions, others must pay the cost of government. In particular, small and young business firms are usually not eligible for incentive programs like that being offered to Spirit, and therefore must bear a disproportional share of the cost of government. This is an important consideration, as Wichita is relying on entrepreneurship as a principle method of growing its economy. The cost of these tax abatements burdens a class of business firms that can’t afford additional cost and risk. These are young startup firms, the entrepreneurial firms that we need to nurture in order to have real and sustainable economic growth and jobs. This action — the award of incentives to an established company — is harmful to the Wichita economy for its strangling effect on entrepreneurship and young companies. As this company and others receive incentives and escape paying taxes, others have to pay. There’s plenty of evidence that entrepreneurship, in particular young business firms, are the key to economic growth. But Wichita’s economic development policies, as evidenced by this action, are definitely stacked against the entrepreneur. As Wichita props up its established industries, it makes it more difficult for young firms to thrive. While Spirit seeks to avoid paying millions in sales tax, it campaigned for ordinary Wichitans to pay more sales tax. 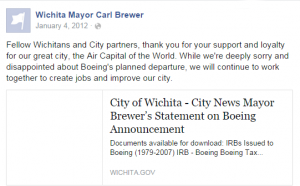 When Wichita placed a one cent city sales tax on the ballot in November 2014, Spirit Aerosystems contributed $10,000 to the group campaigning in favor of the sales tax. 5 Spirit’s immediate past president contributed $10,000 to the same effort. This week American City Business Journals presented the results of a study of small business vitality in cities. 6 Wichita ranked at number 104 out of 106 cities studied. Awarding incentives to large companies places small business at a disadvantage. Not only must small business pay for the cost of government that incentivized companies avoid, small companies must also compete with subsidized companies for inputs such as capital and labor. Two economic development items on tap in Wichita this week illustrate failures or shortcomings of the regime. 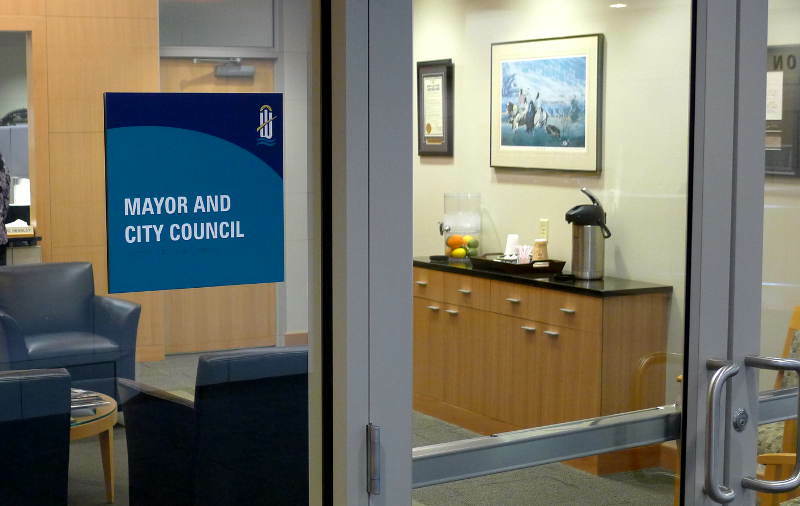 Update: Both items passed by seven to zero votes at the March 1, 2016 council meeting. 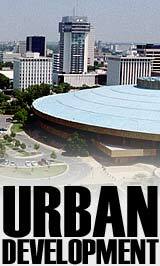 This week the Wichita City Council will consider two economic development items. The first item concerns a company named Epic Sports. In 2012 this company received property tax abatements from the City of Wichita in exchange for a 100 percent property tax exemption. The measure passed by a vote of six to one, with former council member Michael O’Donnell voting no. Now Epic Sports has found greener pastures, it seems. Well, it didn’t just find them, it sought them, according to city documents: “The company approached economic development professionals in Butler County regarding incentives.” The same documents note “[Butler County] professionals did not target Epic Sports as a prospect for relocation.” With the new focus on regionalism, we can’t have one county poaching companies from another, it seems. The city has negotiated that Epic Sports will repay 55 percent of the forgiven property taxes. The second item the council will consider concerns a company that received a property tax exemption based on a commitment to invest a certain amount of capital and create a certain number of jobs. While the capital investment was made, the company has not met the jobs goal. In this case the city is invoking a portion of its economic development policy which allows modification of an incentive agreement based on poor economic conditions. If the Current Conditions Index, a product of the Center for Economic Development and Business Research at Wichita State University, drops by five or more points during the term of an incentive agreement, the city can make a modification. Based on this, the city is extending the deadline for the company to meet the jobs goal. 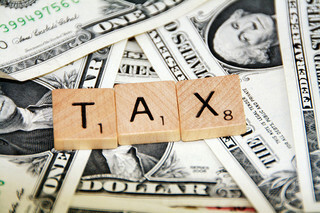 Repayment of forgiven property taxes could be required if the company does not meet the deadline. Wichita considers three tax abatements, in one case forcing an “investment” on others that it itself would not accept. This week the Wichita City Council will consider three tax abatements to companies in the aerospace business. Two are very large companies, and one is in the small business category. In two cases the tax abatements are implemented through industrial revenue bonds. Under this program the city is not lending money. Instead, the program is a vehicle, created by under Kansas law, for companies to avoid paying property tax. In some cases companies may also avoid paying sales tax. In another case the property tax abatement is conveyed through the city’s Economic Development Tax Exemption (“EDX”) program, which allows the city to forgive the payment of property taxes. In many instances, the issuance of Industrial Revenue Bonds is required by law in order to achieve tax forbearance. The EDX program does away with the often meaningless issuance of bonds, and lets the city implement, in a streamlined fashion, the primary economic goal: Granting permission to skip the payment of property taxes. But later in the same document, we see “The IRBs will be purchased by Cessna and will not be offered to the public.” So the IRBs — the bonds the city is authorizing — aren’t really financing anything. By buying the bonds itself, Cessna is self-financing the purchases or obtaining the funds in some other way. The IRBs are merely a device to grant tax abatements. Nothing more than that — except that the bond program obfuscates the true economic meaning of the transaction, adds costs to the applicant company, and adds cost to the city (offset to some degree by fees paid by the applicant company). Regardless of the cost and hassle to Cessna, the program has a payoff. City documents state that Cessna could save as much as $317,357 per year in property taxes. For the Bombardier Learjet IRBs, the city tells us that “Bond-financed purchases are also exempt from state and local sales taxes.” The amount of abated taxes is not given. For Perfekta, an aerospace supplier, the city is using the EDX program to convey a property tax abatement, with the estimated value of the tax exemption in the first full year being approximately $110,792, according to the agenda packet. The county and school district have no choice but to accept the decision made by the city and accept a “return” lower than the city would accept for itself. The city presents a benefit-cost ratio to illustrate that by giving up some property taxes, it gains even more tax revenue from other sources. But a positive benefit-cost ratio is not remarkable. 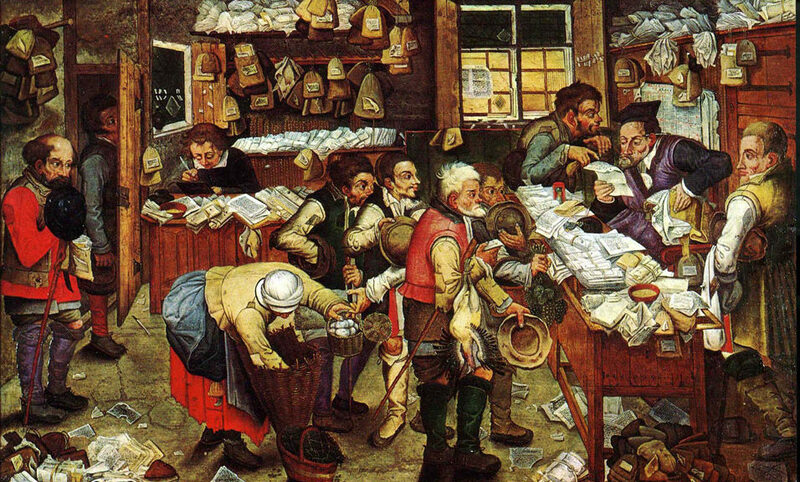 Economic activity generally spawns more economic activity, which government then taxes. The question is: Did the city, county, school district, and state need to give up tax revenue in order to make these investments possible? A major reason why these tax abatements are harmful to the Wichita economy is its strangling effect on entrepreneurship and young companies. As these companies and others escape paying taxes, others have to pay. This increases the burden of the cost of government on everyone else — in particular on the companies we need to nurture. There’s plenty of evidence that entrepreneurship, in particular young business firms, are the key to economic growth. But Wichita’s economic development policies, as evidenced by this action, are definitely stacked against the entrepreneur. As Wichita props up its established industries, it makes it more difficult for young firms to thrive. Wichita relies on targeted investment in our future. Our elected officials and bureaucrats believe they have the ability to select which companies are worthy of public investment, and which are not. It’s a form of centralized planning by government that shapes the future direction of the Wichita economy. These targeted economic development efforts fail for several reasons. First is the knowledge problem, in that government simply does not know which companies are worthy of public investment. This lack of knowledge, however, does not stop governments from creating policies for the awarding of incentives. 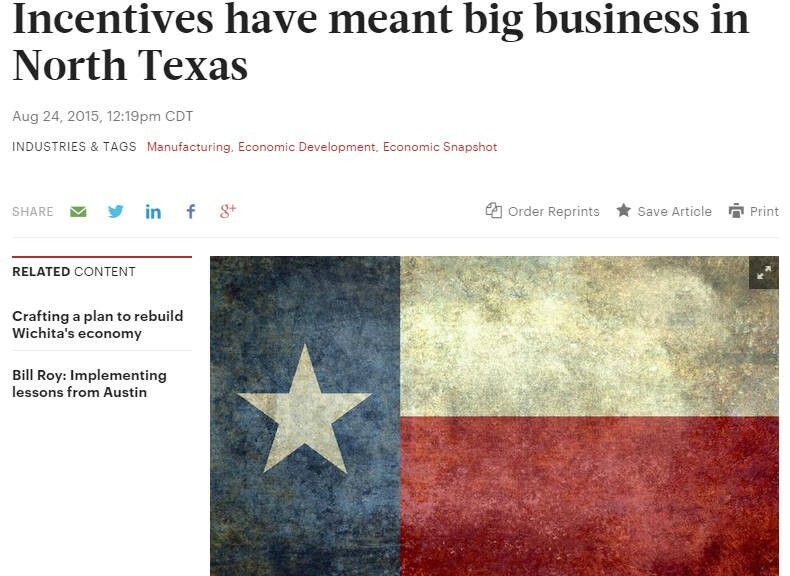 This “active investor” approach to economic development is what has led to companies receiving grants or escaping hundreds of millions in taxes — taxes that others have to pay. That has a harmful effect on other business, both existing and those that wish to form. Young entrepreneurial companies are particularly vulnerable. There is also substantial research that is it young firms — distinguished from small business in general — that are the engine of economic growth for the future. We can’t detect which of the young firms will blossom into major success — or even small-scale successes. The only way to nurture them is through economic policies that all companies can benefit from. Reducing tax rates for everyone is an example of such a policy. Abating taxes for specific companies through programs like the Wichita city council is considering this week is an example of precisely the wrong policy. We need to move away from economic development based on this active investor approach, especially the policies that prop up our established companies to the detriment of dynamism. We need to advocate for policies — at Wichita City Hall, at the Sedgwick County Commission, and at the Kansas Statehouse — that lead to sustainable economic development. We need political leaders who have the wisdom to realize this, and the courage to act appropriately. Which is to say, to not act in most circumstances. When Kansas cities grant economic development incentives, they may also unilaterally take action that affects overlapping jurisdictions such as counties, school districts, and the state itself. The legislature should end this. When Kansas cities create tax increment financing (TIF) districts, the overlapping county and school district(s) have an opportunity to veto its creation. But for some other forms of incentives, such as tax increment financing district redevelopment plans, property tax abatements, and sales tax abatements, overlapping jurisdictions have no ability to object. There seems to be no rational basis for not giving these jurisdictions a chance to object to the erosion of their tax base. This is especially important for school districts, as they are often the largest tax consumer. As an example, when the City of Wichita offered tax abatements to a company in June 2014, 47 percent of the abated taxes would have gone to the Wichita school district. But the school district did not participate in this decision. State law gave it no voice. In this case, the city forced a benefit-cost ratio on the county that the city would not accept for itself, unless it uses a loophole. For the school district, the net benefit is zero. The Kansas Legislature should look at ways to make sure that overlapping jurisdictions are not harmed when economic development incentives are granted by cities. The best way would be to require formal approval of the incentives by counties, school districts, and any other affected jurisdictions. It is not known whether these ratios include the sales tax forgiveness. While the City of Wichita insists that projects show a benefit-cost ratio of 1.3 to one or better (although there are many exceptions), it doesn’t apply that standard for overlapping jurisdictions. 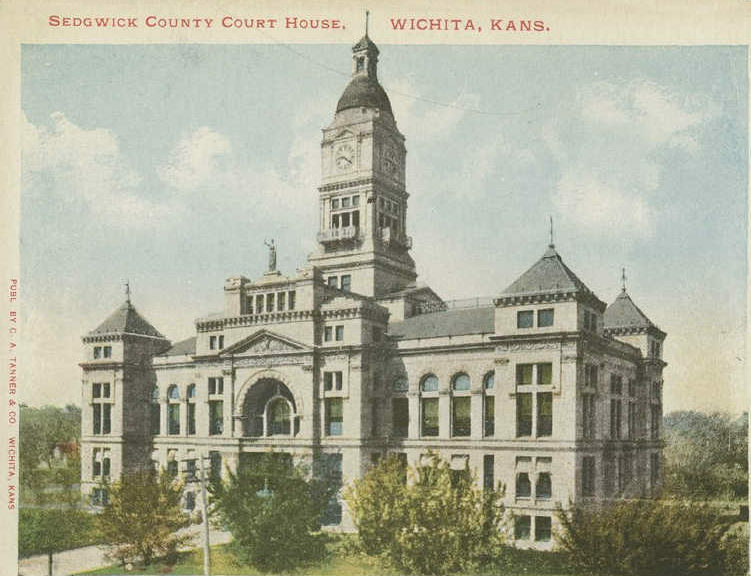 Here, Sedgwick County experiences a benefit-cost ratio of 1.18 to one, and the Wichita school district (USD 259) 1.00 to one. These two governmental bodies have no input on the decision the city is making on their behalf. The school district’s share of the forgiven taxes is 47.4 percent. Note that the ratio for the Derby school district is 1.00 to one, far below what the city requires for projects it considers for participation. That is, unless it uses a loophole. When considering whether to grant three property tax abatements, the Wichita city council is unlikely to ask this question: Why can’t these companies expand if they have to pay the same taxes everyone else pays? This week the Wichita City Council will consider property tax abatements for three different companies. One is a new request for property tax relief under the city’s Economic Development Tax Exemption (EDX) program. The company is a supplier to the aerospace industry. The second is a request for a five-year extension of a five-year property tax abatement. The company met the goals established five years ago. This company is a supplier to the aerospace industry. The third is another request for a five-year extension of a five-year property tax abatement. The company met the goals established five years ago. This company is a supplier to the oil and gas industry. To justify the cost of the tax abatements, the city presents benefit-cost ratio calculations. The city requires that the ratio be at least 1.3 to one, although there are exceptions. In each of these three cases the benefit-cost ratio for the school district is less than 1.3 to one. The city, in other words, is forcing school districts to accept investments that the city itself would not make, unless it invoked an exception. The school districts have no ability to limit their participation in these tax abatements other than lobbying the city. For all the information provided in city documents, some important questions remain unanswered. Perhaps the most important question is this: Are these tax abatements necessary for these companies to carry out their expansion plans? City documents are silent on this question. Was it a question of feasibility? Some economic development programs require that the applicant demonstrate the necessity of an incentive. Often the city presents a “gap” analysis that purportedly shows a gap between available financing and what is necessary to make the project feasible. But these arguments were not advanced. If they had — that is, if the companies say that if they have to pay property taxes then they can’t afford to expand — then we would be stuck with this question: Why are Wichita industrial property taxes so high that investments like this are not feasible? There’s plenty of evidence that entrepreneurship, in particular young business firms, are the key to economic growth. But Wichita’s economic development policies, as evidenced by this action, are definitely stacked against the entrepreneur. As Wichita props up its established industries, it makes it more difficult for young firms to thrive. Wichita relies on targeted investment in our future. Our elected officials and bureaucrats believe they have the ability to select which companies are worthy of public investment, and which are not. It’s a form of centralized planning by the state that shapes the future direction of the Wichita economy. There is also substantial research that is it young firms — distinguished from small business in general — that are the engine of economic growth for the future. We can’t detect which of the young firms will blossom into major success — or even small-scale successes. The only way to nurture them is through economic policies that all companies can benefit from. Reducing tax rates for everyone is an example of such a policy. Abating taxes for specific companies through programs like the Wichita city council used this week is an example of precisely the wrong policy. 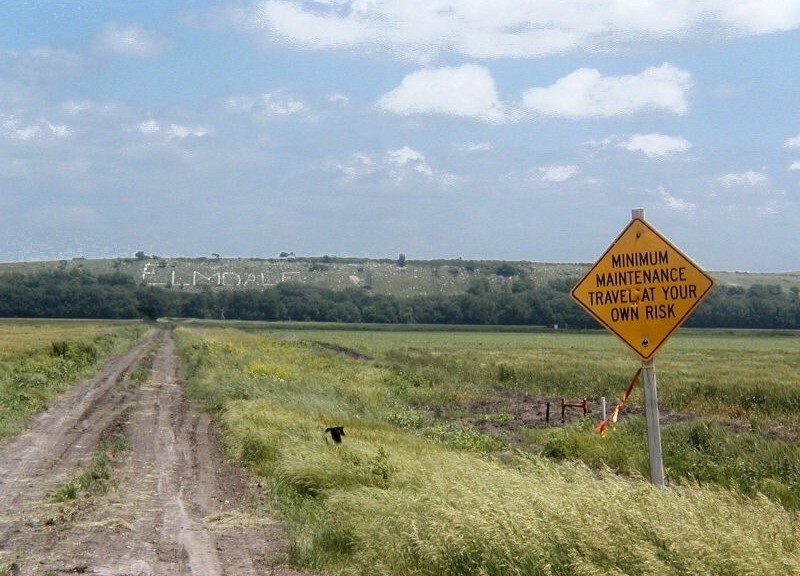 Can eliminating sales tax exemptions in Kansas generate a pot of gold? Advocates of eliminating sales tax exemptions in Kansas point to the great amount of revenue that could be raised if Kansas eliminated these exemptions, estimated at some $5.9 billion per year. 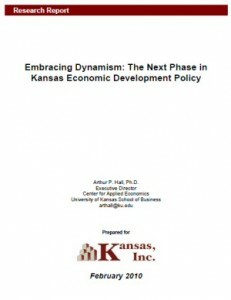 Analysis of the nature of the exemptions and the amounts of money involved, however, leads us to realize that the additional tax revenue that could be raised is much less than spending advocates claim, unless Kansas was to adopt a severely uncompetitive, and in some cases, unproductive and harshly regressive tax policy. A recent advocate for eliminating some sales tax exemptions is Phillip Brownlee of the Wichita Eagle editorial board. In a previous op-ed on this topic he wrote ” And with each added exemption, the state is losing out on more revenue — $5.9 billion this fiscal year, according to the Kansas Department of Revenue. That’s money the state could be using to cover its budget shortfalls, increase funding to public schools or further reduce its income-tax rates.” At least he mentioned reducing other tax rates. Usually advocates of closing sales tax exemptions simply want more tax money to spend. Kansas sales tax exemptions, simplified. Click for larger version. $5.9 billion dollars, by the way, is a lot of money, almost as much as the state’s general fund spending. But we need to look at the nature of these exemptions. I’ve prepared a simplified table based on data from the Kansas Department of Revenue. I simplified because there are many deductions that probably should be eliminated, but they represent very small amounts of money. Some sales tax exemptions are for categories of business activity that shouldn’t be taxed, at least if we want to constrain the state to a retail sales tax only. An example is exemption 79-3606 (m), described as “Property which becomes an ingredient or component part of property or services produced or manufactured for ultimate sale at retail.” The tax that could be collected, should the state eliminate this exemption, is given as $3,083.24 million ($3,083,240,000). But this exemption isn’t really an “exemption,” at least if the sales tax is a retail sales tax designed to be levied as the final tax on consumption. That’s because these goods aren’t being sold at retail. They’re sold to manufacturers who use them as inputs to products that, when finished, will be sold at retail. Most states don’t tax this type of sales. If Kansas decided to tax these transactions, it would place our state’s manufacturers at a severe disadvantage compared to almost all other states. There are two other exemptions that fall in this category of inputs to production processes, totaling an estimated $632 million in lost revenue. Another similar exemption is “Machinery and equipment used directly and primarily in the manufacture, assemblage, processing, finishing, storing, warehousing or distributing of property for resale by the plant or facility.” Its value is nearly $159 million. Together, these exemptions account for $3,874 million of the $5,900 million in total exemptions. Another big-dollar exemption is “items already taxed” such as motor fuel. This is an estimated $318.90 million loss in revenue. Other exemptions are purchases made by government, or purchase made by contractors on behalf of government. These account for an estimated $624.90 million in lost revenue. If these two exemptions were eliminated, the government would be taxing itself. Not taxing prescription drugs means lost revenue estimated at $96.49 million. If the state started taxing residential and agricultural use utilities, it could gain an estimated $169.98 million. These taxes, like the sales tax on food and the motor fuel tax, fall hardest on low-income families. As Kansas is one of the few states to tax food, do we want to make life even more difficult for low-income households? So when the Eagle’s Brownlee writes “As is, favored groups are saving billions of dollars a year, worsening the tax burden for everybody else” he must be including broad categories of business like “All Kansas manufacturing companies” as a “favored group.” Or maybe he means prescription drug users are a “favored group.” Or families struggling to pay utility bills. But there are more problems. Brownlee describes these sales tax exemptions as a “cost in lost revenue of $5.9 billion last fiscal year.” The only way this makes sense is if one thinks that our property (our money) first belongs to the state, and that in order to spend it, we have to give the state its cut. That’s an opinion — ideology, if you will — that you may agree with, or you may oppose. What’s remarkable — shocking, really — is that in his previous career Brownlee was a Certified Public Accountant. He ought to understand the nature of sales taxes meant to be applied to retail sales, not components of manufactured goods. Reporting by the Wichita Business Journal regarding economic development incentives in Wichita makes a big mistake in overlooking where the real money is. An example used in the article is Toyota’s decision to move its North American headquarters to Plano. Toyota received incentives in conjunction. The article quotes Jim Lentz, CEO of Toyota North America, as saying “The incentives are really important.” But that hasn’t always been the line from Toyota. At the time of the announcement last year, Forbes reported that incentives were a small part of Toyota’s decision, and that other cities likely offered more. Similar reporting came from the Houston Chronicle. We can easily imagine Lentz coming to his senses, realizing that he needs to credit the incentives with at least some role in Toyota’s decision. Otherwise the local taxpayers — who have to pay for the incentives — might feel duped. But a serious problem with the article is the claim that “But incentives now seem to be off the table in Wichita.” This is an assertion made by others, including our mayor and city council members. Usually it’s qualified that cash incentives are off the table. Instead, the incentives most commonly used — where the real money is — are tax abatements. The incentives illustrated above are common in Wichita. Again, with the city failing to track the award of incentives, it’s difficult to know just how common. 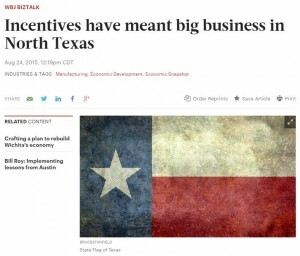 But we can safely say that the assertion by the Wichita Business Journal that “Incentives now seem to be off the table in Wichita” is incorrect. Worse than that, it’s irresponsible to make such a statement. In Sedgwick County, we see that once companies are accustomed to government entitlements, any reduction is met with resistance. When an executive of Spirit Aerosystems accused the Sedgwick County Commission of “working against us,” the company may have forgotten the assistance and special treatment the company has received from local governments and taxpayers. This assistance has amounted to hundreds of millions of dollars over several decades, when we consider both Spirit and its predecessor, Boeing. Now, Spirit objects to a proposed reduction in funding to Wichita Area Technical College, and also cuts to local attractions such as the zoo. The proposed cut to WATC is less than the cut made the year before, although part of that cut was rescinded, making the proposed cut equal to last year’s cut. These cuts follow a trajectory recommended by the former county manager, who was widely praised as understanding and accommodating the needs of area business firms. So when Spirit accuses county taxpayers as working against the company, it’s a little hard to stomach. Residents of Sedgwick County pay higher taxes so that Spirit can pay less. Following, a discussion of a Spirit Aerosystems tax abatement request from 2014. This week the Wichita City Council will hold a public hearing concerning the issuance of Industrial Revenue Bonds to Spirit AeroSystems, Inc. The purpose of the bonds is to allow Spirit to avoid paying property taxes on taxable property purchased with bond proceeds for a period of five years. The abatement may then be extended for another five years. Additionally, Spirit will not pay sales taxes on the purchased property. The City of Wichita has a policy where economic development incentives should have a benefit cost ratio of 1.3 to one or greater for the city to participate, although there are many loopholes the city regularly uses to approve projects with smaller ratios. Note that the ratio for the Derby school district is 1.00 to one, far below what the city requires for projects it considers for participation. That is, unless it uses one of the many available loopholes. We have to wonder why the City of Wichita imposes upon the Derby school district an economic development incentive that costs the Derby schools $143,038 per year, with no payoff? Generally the cost of economic development incentives are shouldered because there is the lure of a return, be it real or imaginary. But this is not the case for the Derby school district. This is especially relevant because the school district bears, by far, the largest share of the cost of the tax abatement. Of note, the Derby school district extends into Wichita, including parts of city council districts 2 and 3. These districts are represented by Pete Meitzner and James Clendenin, respectively. Along with the mayor’s statement the city released a compilation of the industrial revenue bonds authorized for Boeing starting in 1979. The purpose of the IRBs is to allow Boeing to escape paying property taxes, and in many cases, sales taxes. According to the city’s compilation, Boeing was granted property tax relief totaling $657,992,250 from 1980 to 2017. No estimate for the amount of sales tax exemption is available. I’ve prepared a chart showing the value of property tax abatements in favor of Boeing each year, based on city documents. There were several years where the value of forgiven tax was over $40 million. 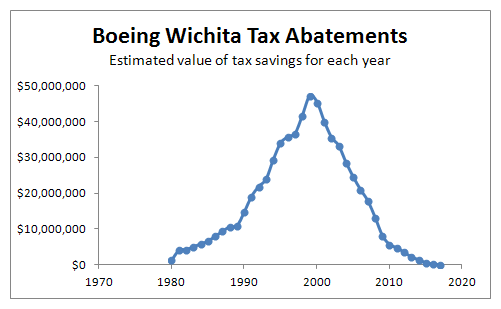 Boeing Wichita tax abatements, annual value, from City of Wichita. Boeing is the poster child for corporate tax incentives. This company has benefited from property tax incentives, sales tax exemptions, infrastructure investments and other tax breaks at every level of government. These incentives were provided in an effort to retain and create thousands of Kansas jobs. We will be less trusting in the future of corporate promises. 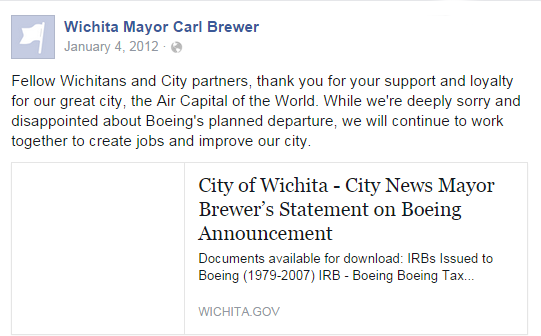 Not all the Boeing incentives started with Wichita city government action. But the biggest benefit to Boeing, which is the property tax abatements through industrial revenue bonds, starts with Wichita city council action. By authorizing IRBs, the city council cancels property taxes not only for the city, but also for the county, state, and school district. Wichita city leaders are proud to announce the end of cash incentives, but they were only a small portion of the total cost of incentives. 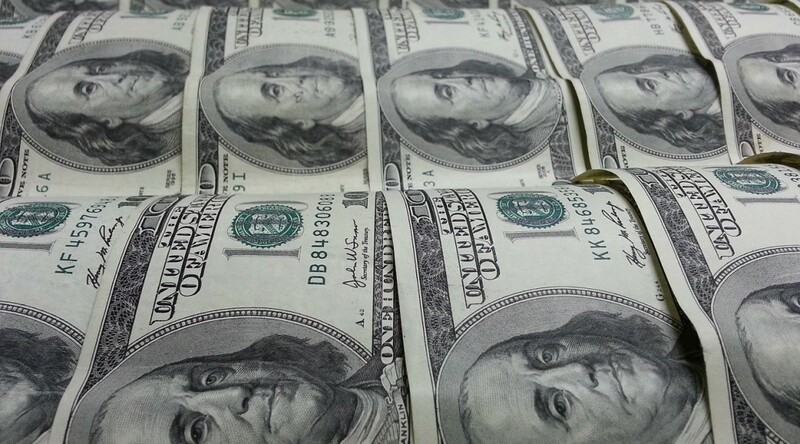 Wichita city leaders say that cash incentives are on the way out. That’s a welcome change. Cash incentives, however, were only a small part of the city’s spending on incentives. Far more costly are property and sales tax abatements, tax increment financing, and various programs at the state level. There seems to be no appetite to reduce reliance on these. 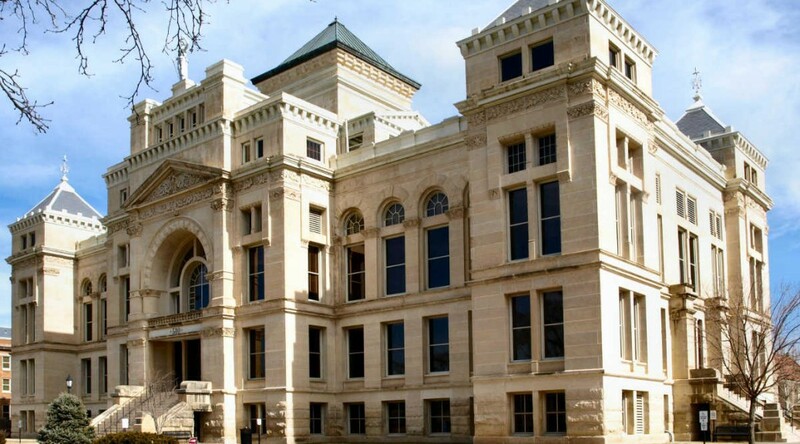 Wichita city leaders will take credit for reforming the use of incentives, but cash incentives were only a small portion of the total cost of incentives. It’s up to citizens to be watchful of the total cost of incentives, as the city does not make this data available.